I'm so happy you could join me this morning, and WELCOME!! 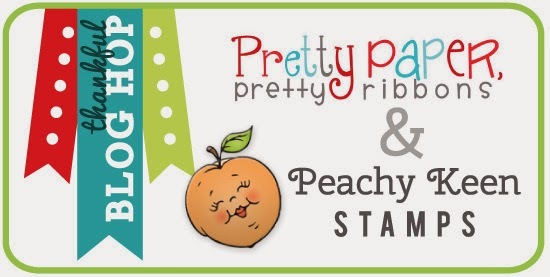 I've got this adorable little K-Cup holder that I created for this fabulous blog hop featuring SVG files from Pretty Paper, Pretty Ribbons and Peachy Keen Stamps! 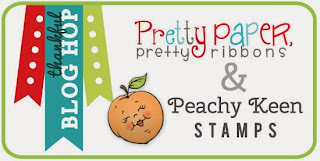 Our talented teams have come together to show you just what you can do with PPPR SVG files and Peachy Keen Stamps. If you've been hopping along from the beginning, then you've seen some amazing creations, but if you're just getting started, then you'll want to go back to the beginning at The Pretty Paper, Pretty Ribbons Blog and start from there, so you don't miss out on any of the Thankful Themed projects. You should have arrived here from the very talented Brianna's Happer Scrapper Blog. Didn't you LOVE her sweet Thanksgiving card? WOW! Here's what I created using the Pumpkin Spice Patterned Paper Pack #1 (digital download), K-Cup, and Nuts About You cutting files from PPPR and the PKSC-22 Stamp of the Month stamp set from Peachy Keen Stamps. From this side view you can see the beautiful chevron patterned paper that I used for the inside. That digital paper is wonderful!! I printed two sides of one sheet of card stock so that I had reversible paper! How cool is that?? I love the thought of giving K-Cups as a nice hostess gift for Thanksgiving. My Keurig brewing system is getting LOTS of use with this cold weather, and these cute little gift boxes are PERFECT for gift giving!! I've got to tell you that cutting all these pieces with colored card stock seemed like a daunting task to me, so I did what I do with many of my die cuts. I cut the branch, leaves and acorns using white card stock and I colored them with my Copic markers. Voila! much easier as far as I'm concerned and I love that I can personalize the look of the finished piece with my markers. I added a lot of texture to the leaves using a stippling method of coloring. FUN!! Before you move along on this hop, please be sure to comment and hopefully if you been hopping, you've commented along the way, because both PPPR and PKS are giving away a $15 Gift Certificate to one lucky hopper! Will it be you? We don't know yet who will be drawing the winning name, so comment on each blog for the best chance to win. Please be sure to leave your contact information so that we can get in touch with you to let you know you won. :-) NOW, ON WITH THE HOP!! Your next stop on this hop is at super talented Jeanne Siegel's Paper Crafts Blog. Have fun and enjoy!! Below is the complete blog hop order just in case you get lost along the way. GREAT inking on the leaves- they look really natural. Thanks for sharing this! I'm so happy to say that I've sampled your K Cup coffee my friend! (And mixed 'em all up on the stand out of naughtiness)LOL I love this little treat bag and might have to invest in that file as you've shown me how gorgeous and clever it can be! Thanks for the tip about coloring the cuts with marker! Sure saves time and paper! Love this little project. Beautiful! This is just fantastic. This is Awesome, love the holder, so pretty. Great K-cup holder. Perfect for a little hostess gift. Gorgeous bag Lorie! Those leaves look REAL...you did a fabulous job on them! BEAUTIFUL!!! Beautiful job coloring up your acorn branch! Love your stippled leaves! Lovely project! Love your K-cup holders; they would make table favors. Love love love this little holder, gr8t job! Wonderful job! Thanks for the inspiration of cutting files in white & then coloring. My mind just doesn't work that well. That is a beautiful little project!! Love all the details!!! So glad to be a part of this hop with you! WOW Lorie!!! This is so super AWESOME!!! Your coloring always amazes me and your project is FAB!!! FABULOUS!!! Those chestnuts look so real. Love it!!! Love the leaves! So cute. K-Cup holder looks great! I need to make my sister one of these! gorgeous little treat box and I love how you colored in your die cuts, your technique is fabulous!! Very nice hostess gift idea! Your K-cup holder is wonderful...love the paper you chose. Your leaves and acorns are beautiful the way you stippled them. Super job! This is just absolutely stunning, Iove it!! The paper choice was fabulous and so are your oak leafs and acorns!! this is beautiful!!!!! I love your coloring!! amazing! !